Are you a blogger, video creator, or podcaster? Are you wondering how creators are making money? In the first study of its kind, Social Media Examiner commissioned a comprehensive study of more than 4,300 creators. 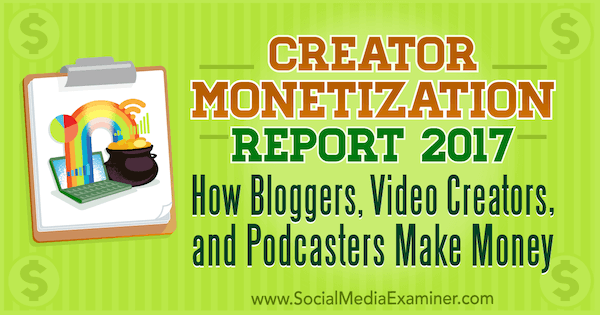 Creator Monetization Report 2017: How Bloggers, Video Creators, and Podcasters Make Money by Michael Stelzner on Social Media Examiner. The most common ways creators monetize their work. What produces the most revenue for bloggers, video creators, and podcasters. How creators will be changing their monetization plans over the next year. How bloggers, video creators, and podcasters differ in their money-making strategies. How more experienced creators monetize. How bloggers, video creators, and podcasters plan on changing their publication frequency in the coming year. The world’s leading authorities on blogging, video creation, and podcasting helped produce this study. It was commissioned and written by Social Media Examiner’s founder Michael Stelzner, author of the annual Social Media Marketing Industry Report and the book Writing White Papers. Tim Schmoyer: Tim is a leading authority in the video creator community and founder of VideoCreators.TV. Darren Rowse: Darren is a leading authority in the blogging community and founder of Problogger.com. Cliff Ravenscraft: Cliff is a leading authority in the podcasting community and founder of PodcastAnswerMan.com. Special thanks to Ray Edwards, Leslie Samuel of Become a Blogger, and Interview Valet for helping collect creators for this study. For many of the creators we studied (28%), the blog posts, videos, and podcasts they create don’t make money. However, for some creators (29%), it’s their main source of revenue. For those creators who actually make money from their content, advertising is the number-one way they make money (50%), followed by selling their own products (46%) and services (42%). Advertising is the top way that creators monetize. Bloggers are more likely to sell their own products (50%) and services (49%) than accept advertising (39%). Video creators overwhelmingly monetize by advertising (71%), followed by selling their own products (36%) and services (27%). Podcasters mostly tend to monetize by selling their own services (63%) and products (62%), followed by paid speaking (39%). Only 31% of podcasters make money via advertising. What makes creators the MOST money? When asked to select the single method that makes them the most money, creators indicated that advertising was the most lucrative source of income. However, services and products followed closely behind. In fact, the spreads were so close that 81% of creators agreed that one of these three makes up the biggest source of revenue. Advertising is the top source of revenue for creators. Bloggers make the most money by selling services (31%), followed by selling their own products (26%). Video creators make the most money via advertising (46%), followed by selling their own products (19%). Podcasters make the most money through selling their services (39%), followed by selling their own products (24%). Has the money increased in the last year for creators? Simply said, yes! Half of all creators are making more money today than they did 12 months ago. Only 13% said they are making less. Half of all creators have seen an increase in revenue over the last 12 months. More podcasters (59%) saw an increase in their revenue over the last year than bloggers or video creators. Are creators satisfied with the revenue they’re making? A significant percentage disagreed! Only 24% agreed they’re satisfied with their revenue. A significant 62% are NOT satisfied with their monetization income. Simply put, creators want more. Nearly two-thirds of creators are not satisfied with the revenue they’re generating. Selling their own products: 67% of creators plan on doing more of this. 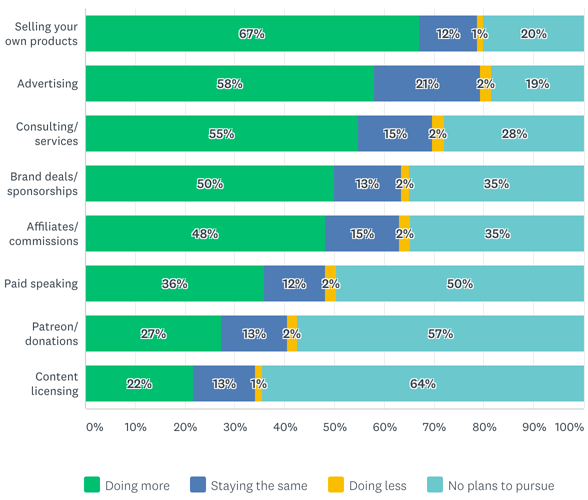 Advertising: 58% plan on increasing their ads. 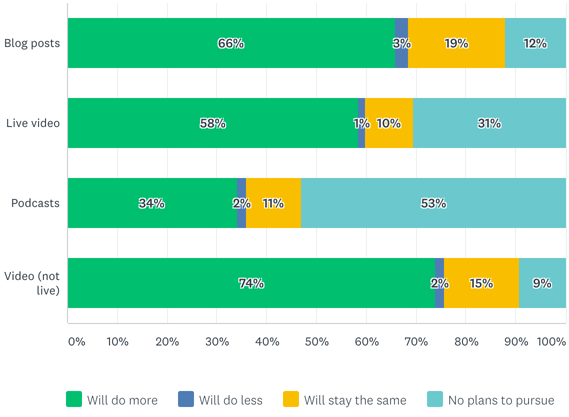 Consulting/services: 55% have plans to do more here. Brand deals and sponsorships: 50% plan on working more with brands. Two-thirds of creators plan on selling more of their own products in the next 12 months. 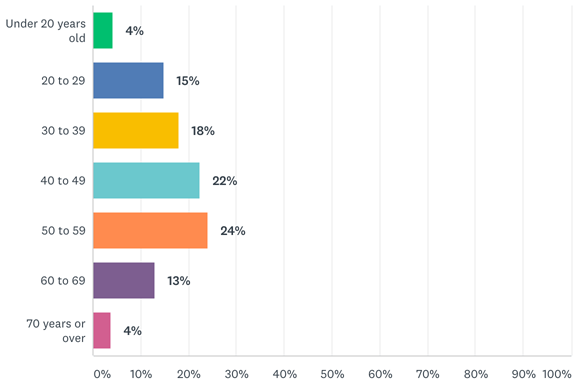 Podcasters overwhelmingly (80%) plan on selling more of their own products in the next year. How do new creators monetize compared to the most experienced creators? 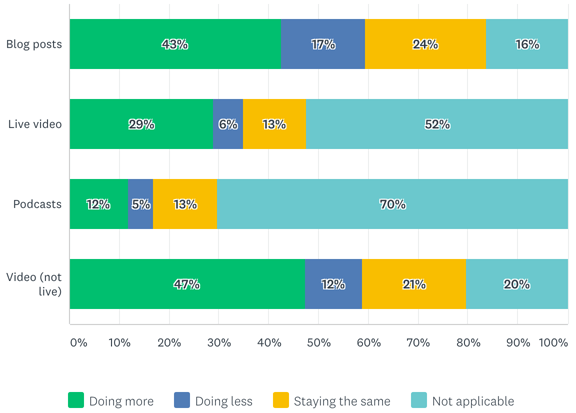 We analyzed creators who monetize and have less than a year of experience, and compared them to creators who monetize and have more than five years’ of experience. The key to interpreting this data is to remember that more experienced creators may have figured out more lucrative revenue models. It’s interesting to note that consulting/services offers the most revenue for the most experienced creators regardless of medium. What monetization methods do creators want to learn more about? 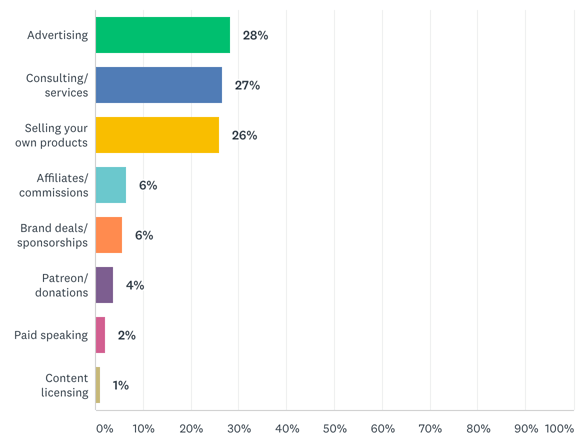 Creators are most interested in learning how to sell their own products (58%), followed by accepting advertising (56%), and then striking deals with brands and sponsorships (53%). Creators are most interested in learning how to generate revenue by selling their own products. 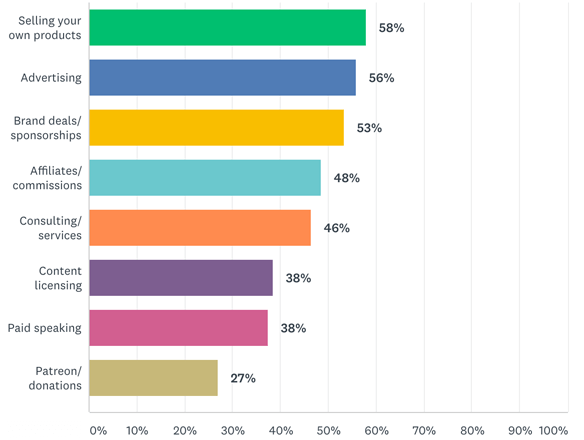 Video creators most want to learn about brand deals and sponsorships (62%). What other forms of content do creators create? Bloggers: 36% of bloggers create video content, 17% do live video, and 8% podcast. Video creators: 26% of video creators also create blog posts, 24% use live video, and 7% are also podcasters. 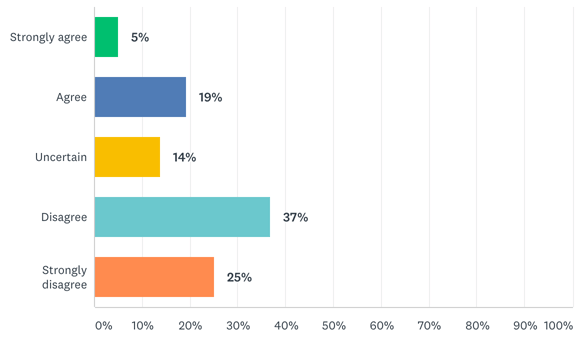 Podcasters: 55% of podcasters also blog, 40% use video, and 31% are using live video. How often are creators publishing content? How have creators changed their posting frequency in the last year? We asked creators if they’re creating more or less content than they did a year ago. 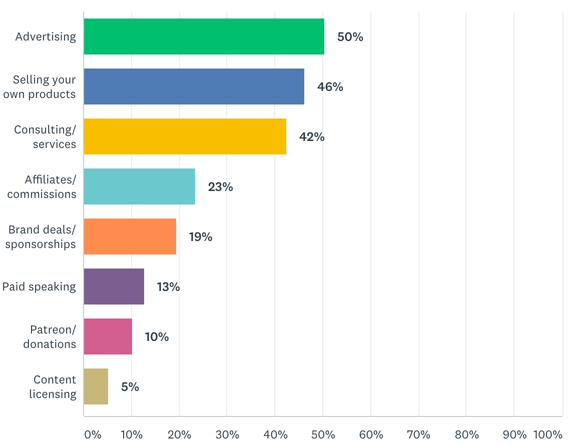 Nearly half (47%) said they’re creating more videos than they did last year. Nearly half of creators are posting more video than they did a year ago. Bloggers (53%) said they increased their blog post frequency. Video creators (61%) upped their video posting frequency. Podcasters (49%) have increased their podcast frequency. Over the next year, creators plan on increasing their publishing frequency for video (74%), blog posts (66%), live video (58%), and then podcasting (34%). Seventy-four percent of creators plan to post more video in the next 12 months. Bloggers plan on upping their blog post frequency (75%) and videos (70%). Video creators plan on increasing their video publication frequency (79%) and use of live video (62%). 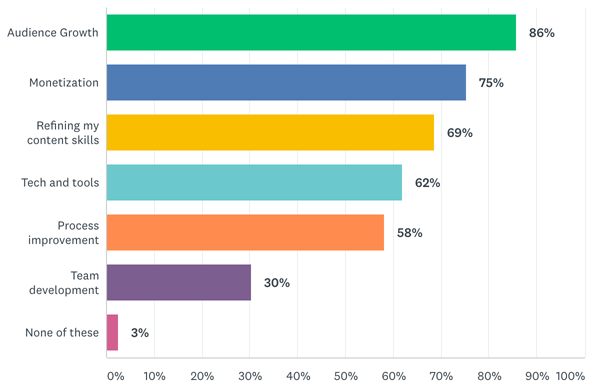 Podcasters plan on more frequently publishing videos (73%) and live videos (71%). Where do creators want to improve their knowledge? The top three areas where creators would like to improve their knowledge are how to grow their audience (86%), how to monetize their content (75%), and how to refine their content skills (69%). Audience growth is the top area where creators want to improve their knowledge. How big are creators’ teams? Most creators operate as solos or have very small teams. Most creators work alone, or with two- or three-person teams. The creators we studied were slightly more likely to be male (53%). Creators tend to skew slightly male. Bloggers tended to be female (55%). Video creators skewed heavily male (69%). 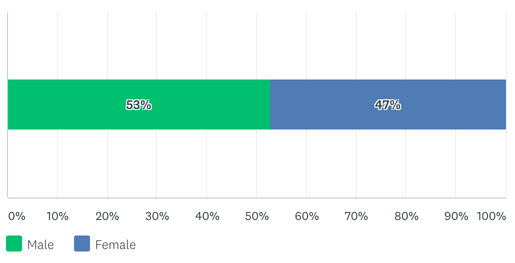 Podcasters also skewed heavily male (74%). The creators we studied tended to be more heavily skewed toward age 40 and older. Creators skew toward age 40 and above. Podcasters were overwhelmingly age 40 and older (73%). Most video creators were evenly distributed between ages 20 and 59 (77%). Bloggers were mostly age 40 and older (68%). What country are these creators from? The creators we studied were from mostly English-speaking countries as follows: United States (52%), United Kingdom (7%), Canada (6%), Australia (4%), and India (4%). The remaining 27% were spread across more than 100 countries. Other study details: This survey was conducted between August 15, 2017 and September 1, 2017. We studied 4,335 creators, of which 2831 were bloggers, 2625 were video creators, and 517 were podcasters. As the above data reveals, many creators focus on more than one medium. What do you think about this research? Please comment in the box below.